Home News Can poor cleaning be a Security Risk? Dirt and grime in your office might well go unnoticed on a day to day basis, but the fact is, dirt quickly builds up. Left for too long, and it can become a hazard in the office, even a security risk. Can it really be considered a security issue? An unclean business can result in increased staff absence, FACT. For smaller businesses (with only a few staff), it can be detrimental to the security of the business when staff numbers are reduced. OK, you may be thinking, this is a real stretch of the imagination to suggest it is a security risk, but bear with me. I have a valid angle to consider. I bought a new motorbike last year. I went for the new Kawasaki Z1000SX and I must say, I am pleased with it so far. Interested to see it? Here you go. The actual (black one and best colour…) I bought. Now, the dealership served me well (so I won’t be naming and shaming them here) and it looked fine in the showroom, from a cleanliness point of view, but the toilets were shocking. Now, I don’t wish to generalise, but blokes might not be quite as conscientious as females when it comes to hygiene standards. I would put money on the fact, females are less likely to put up with poor toilet standards compared to males. Maybe it because blokes stand up and ‘fire from a distance’ whereas females need to sit down .. The toilets were grim, like a scene from Trainspotting (for those who have seen it). For those who haven’t, just imagine the worst toilet you have seen and then double it. I don’t think the toilets had seen a cleaning spray, bottle of bleach or hygiene wipe for many a year. No soap and a towel which looked like it could feature in this years ‘Bacteria of the Year’ awards … you get the idea. 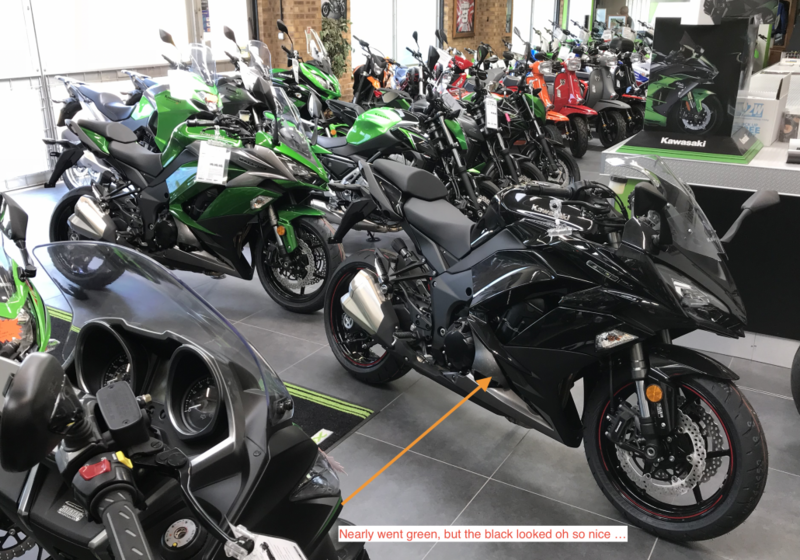 Now, when it comes to a bike dealership (especially in the summertime) it’s normal to see the bikes outside for all to see. This particular dealer does not do that, apparently due to crime in the area. They lost a bike in the past when someone loaded it onto a van and drove off, without anyone noticing. Your staff are employed to serve the business. In this case, help potential and current customers looking for a new motorbike, but also keep an eye out for those looking to steal from you. If staff are absent due to an avoidable illness, you are left short handed and in this particular example, it creates a lapse in security and creates more risk. Some might read this and say ‘No way, you are dreaming if you think this is true’ but take a moment to consider it. Of course, during the winter months, loads of people have coughs colds and splutters and your staff could have caught it from their kids, someone in the supermarket etc. I don’t disagree with that. However, minimising the risks and controlling such a simple thing as hygiene in the washroom, it can help reduce exposure to avoidable germs. If a toilet is cleaned regularly, soap is restocked and adequate hand drying facilities are provided, the risk of spreading germs is reduced and potential illnesses reduced. For staff and the customers who visit your premises, being clean gives the impression you care. If you require a commercial cleaning company to serve your needs, call 01689 85 33 66 or email getintouch@soclean.co.uk.